Now available, Book 3 in the BloodDark Series! 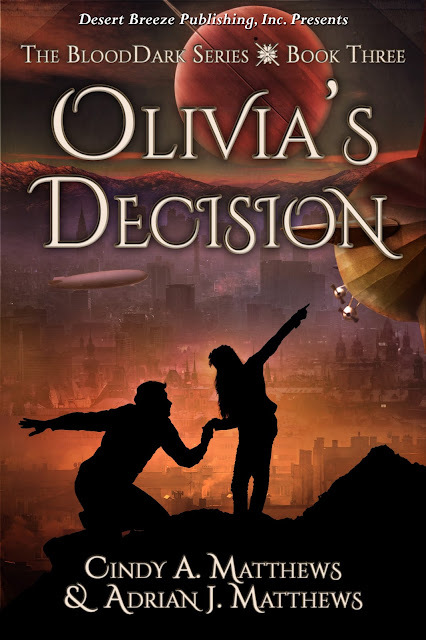 Olivia's chance to prove herself as a spy hasn't gone well. She knows the handsome vampire Moreau is up to something. With the assistance of Kate and Mahvet, Olivia solves the mystery of the rogue Portal and Clan Alpha's illegal artwork sales, then escapes with the help of Valori, whose growing telekinetic powers prove frightening. Hernando is hurt by Olivia's lie, but there's too much at stake to remain mad for long. Even Olivia learns to trust the Pure Bloods. They travel with the ruling council by airship to the Alphans' defensive weapon constructed with materials bought from billionaire Roland Grundfest. She senses the true invaders are Earthmen who've stolen BloodDark's technology for their own purposes. Olivia is torn between Earth and the world and peoples she's come to love. 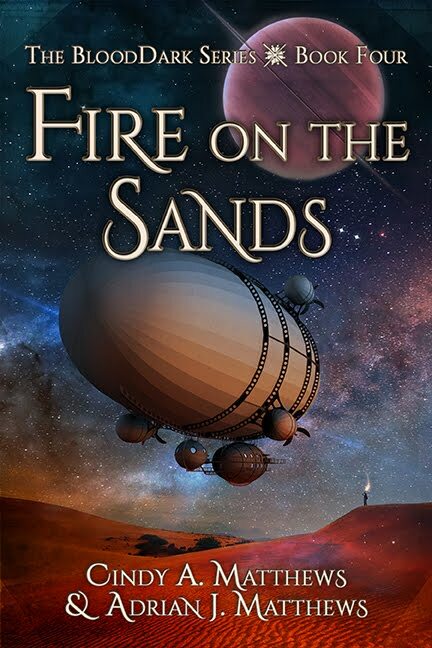 Will a climactic encounter in the desert decide Olivia's--and BloodDark's--fate once and for all? Mahvet swung his arms at a control panel. Olivia dashed over just in time to stop his fist from connecting with it. "Please, professor! Remember, they might have a security device set to alert them if anybody touches it." He took a long breath and pulled back. "You're right. We should go now. I'm not sure I can hold back my desire to wreak vengeance against the sacrilege my kinsmen have committed." She nodded. "Good idea. We leave the way we came in?" "Or the way we came in." Olivia spun around at the sound of Moreau's smug, self-assured voice coming from the feasting hall's main entrance. "You!" she spat at him. "I should have known you were involved in this." "Hello, Olivia. Hello, Mahvet. I see you've discovered where we're keeping our insurance policy." With a casual toss of his blond hair over his shoulder, Moreau broke away from the pack and strode to her side. Olivia recognized his father and uncles among the Pure Bloods standing next to the large double doors, along with a half-dozen beefy Overseers. "Insurance policy is the correct term, isn't it?" "Probably. Who are you paying your premiums to? It wouldn't be Roland Grundfest by chance, would it?" Moreau froze. His eyes narrowed. "How do you know the name?" So, she had something on Golden Boy? She'd better make good use of it. She took a step toward him, hands on hips. "Dear ol' Roland? You could say Mr. Grundfest is a friend of mine. He invited us over for drinks at his palatial home in the Hamptons recently -- even flew us there in our very own jet." Olivia bit her lip to keep from laughing. Poor Moreau furrowed his pale forehead, confused at her odd confession. It was obvious -- no one was supposed to know the Alphans had an exclusive deal running with a human businessman. Why did the Alphans think Grundfest wouldn't give their relationship away? The billionaire was known for his extravagant gestures and hot-headed temper tantrums. His often foolish antics and childish tweets moaning about his competitors made the news almost daily. The Alphans couldn't be so naïve as to believe Roland Grundfest could be trusted. Ah, but Pure Bloods don't receive our newscasts or have access to the internet. They don't realize what a stupid deal they made with Grundfest. Should I enlighten them or let them suffer for it? Keep your thoughts neutral, Olivia, Valori's voice instructed. I can't block all thoughts, all the time, particularly emotional ones. Stay with Moreau and the others. I'll be there soon. "You and your family are a disgrace to Clan Alpha," Mahvet roared. He crossed the room to stand eye to eye with Moreau. "You sully our clan's sacred honor by selling our cherished relics, and for what? To accumulate useless wealth on another world?" Moreau tossed his head back, his golden hair bouncing about his shoulders as he shook with laughter. "Better to have wealth on two worlds than nothing on one. Right, eh, Mahvet? You of all people should know how much we Alphans have struggled to get where we are today. The least of the clans on BloodDark in the dawning times -- the brunt of jokes as we crawled and scraped our way up from the bottom tiers of society to simply survive, but now..." His cobalt eyes glowed with pure arrogance. "We have the power. We have the ability to rule two worlds."